If you enjoy rodeos and bull-riding like Cindy and I do, then the ultimate vacation idea is a trip to the 2010 National Finals Rodeo at the Thomas and Mack Center in Las Vegas, Nevada from December 2 to December 11, 2010. Held every year in Las Vegas, there are also plenty of opportunities to experience all the other attractions that Vegas offers during the daytime, before heading to the Thomas and Mack Arena for the nights activities. There are plenty of chances to meet your favorite cowboys and cowgirls, as well as shop at all the vendors who are located there. National Finals Rodeo Tickets are already on sale and with the popularity of the event it is not too soon to start making plans to attend now. Don't be stuck watching the finals on ESPN, instead enjoy it in Las Vegas this year from December 2nd until December 11th. Originally owned by Thomas and Louise Hitchcock, the woods were transferred to the ownership to the Hitchcock Woods Foundation in 1939 to insure that it would be available for the use of future generations of residents. In 2009, the foundation celebrated 70 years of managing the property, without this management, the land would of most likely of been lost to development like much of the surrounding area. Railroads provide many interesting photographic subjects beyond the engines and cars themselves. 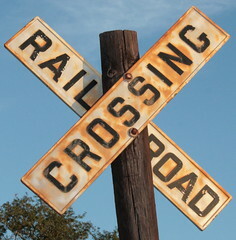 Railroads constructed many elaborate bridges across the United States which still serve today. 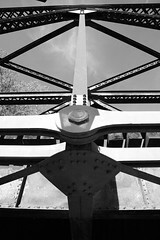 The Iron and Steel work provides interesting angles and contrasts. This shot was taken along the Savannah River in Augusta, Georgia. The bridge carries the Norfolk Southern Railroad into downtown Augusta where it runs in the middle of the street for several blocks before reaching the yard. The trains pass the Augusta History Museum which houses a nice railroad display including a retired Steam Locomotive in all it's glory. The Riverwalk also provides many photographic opprotunities of boats, water, flowers, and birds. Worth a visit if you are in the area. WOW.. great shots of an Owl. Worth a look. The Elkhorn Inn and Theatre in Landgraff, West Virginia is a great destination for railfans, romantics, and for anyone looking for a great bed and breakfast in a remote wilderness setting. The Inn sits right besides the NS Pokey Subdivision with it's high-volume of coal traffic from West Virginia coal mines travelling past day and night. The Inn is equipped with scanners, wi-fi connections, and the ATCS software so you can always be ready to see the next train when it arrives. For the non-railfan, the Elkhorn Inn also offers great trout fishing, ATV riding, and various other outdoor activities in the surrounding area. Elise and Dan Clark also provide delicious dinners at the Inn. They have a varied menu for different tastes and are always tweeting about their latest creations on their account at http://twitter.com/elkhorninn and on facebook. Cindy and I will be visiting the Inn soon for a ROMANTIC weekend and I plan on having lots of photographs from the area to share with you on my blog and websites. Visit the Inn's great website and find plan your next trip now. On my last trip in October to the Blue Ridge Parkway, I purchased "The Blue Ridge Parkway " from the Postcard History Series books at one of the visitor centers. Despite it's name, it is actually a collection of historic postcards all the way from Shenandoah National Park to the Great Smoky Mountains National Park and the Blue Ridge Parkway in between. The book written by Karen Hall with the Friends of the Blue Ridge Parkway has a great variety of postcards. Some of them are of the motels, and other business establishments that the area was famous for. Others are "real-photo" type cards highlighting areas along the BRP and the surrounding area. If you grew up going to the Blue Ridge or the Smokies then this is a book you will really enjoy as it will bring back memories of childhood. If you didn't grow up in the area, you'll understand a lot more about the "days of old" in the area when you hear about it. 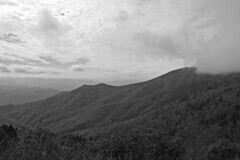 Been listening to podcasts this week from the Great Smokies Mountains National Park and also read a book about historic postcards from the Blue Ridge Parkway and GSMNP. Interesting idea about slowing down photography.. goes along with my idea this year of trying to focus more on the details in life. But have you tried slow photography? It’s like a yoga class for your camera. Long conversations with subjects, patient exposures, and delicate macros will lend your photos a new calmness and longevity — so vital in these rush-rush go-go slam-crash rock-and-roll times. Join the Slow Photo movement, and soon you’ll be measuring exposures not in fractions of a second, but in fractions of an eon. It definately sounds like something I want to investigate further. 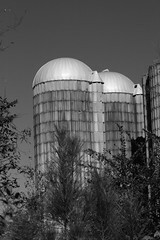 Do you have any photos of interesting water towers? 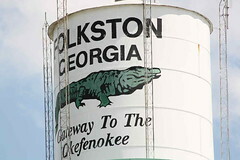 I've always liked the tower in Folkston, Georgia in South Georgia which besides being a railfan mecca, is also the "Gateway to the Okefenokee". Seeing this picture always makes me want to get the camera out and go train watching. I'm hoping that the weekend will be decent and I can spend a day out along the track and get some new photos to share with everyone. I restarted my railfan blog at http://railfan.biz/ and I hope you will visit there to find out more about my railfanning adventures. Ash Wednesday, in the Western Christian calendar, is the first day of Lent and occurs forty-six days (forty days not counting Sundays) before Easter. It is a moveable fast, falling on a different date each year because it is dependent on the date of Easter. It can occur as early as 4 February or as late as 10 March. Ash Wednesday derives its name from the practice of placing ashes on the foreheads of adherents as a sign of repentance. The ashes used are typically gathered after the Palm Crosses from the previous year's Palm Sunday are burned. In the liturgical practice of some churches, the ashes are mixed with the Oil of the Catechumens (one of the sacred oils used to anoint those about to be baptized), though some churches use ordinary oil. This paste is used by the minister who presides at the service to make the sign of the cross, first upon his or her own forehead and then on those of congregants. The minister administering ashes recites the words: "Remember (O man) that you are dust, and to dust you shall return", or "Repent, and believe the Gospel." The fasting associated with Lent spawned pre-Lenten celebrations such as Mardi Gras (Fat Tuesday) and Carnivale as a last chance to eat, drink and be merry before the 40 days of self denial began. Tradition holds that a Philadelphia staple - the soft pretzel - was created by a monk as a Lenten food at a time when the faithful abstained from meat and animal products, such as milk and eggs. While Lent has traditionally been observed by giving up pleasures, such as sweets, churches now encourage the faithful to something during the season that will help others or enrich their spiritual lives. I can see Mark Twain enjoying Mardi Gras. I also know that it is definately not on MY list of things to do. Being around large groups of drunk people does not rate that high. But to all my friends from Twitter and everywhere else who are celebrating.. enjoy. I'm at work today, but here in the United States we are celebrating President's Day. That means that the banks, Federal government, and many schools are closed today. I noticed the difference this morning during my commute as there were no school buses and overall the traffic was greatly reduced. Our company does not celebrate President's Day, so like I said I'm here in the office. It won't effect me to much, unless I needed to buy a stamp, or cash a check at the bank. While President's Day began as a way to celebrate the birthday's of two of our greatest President's (Washington and Lincoln), I think that the day should be used to remember the lives of all of those men who have served, living or dead. We might not always agree with the policies of the sitting President, and we might differ in our opinions of past President's but each of them was willing to serve our country. Several of our President's have died in office, either from an assassin or from illness. All of our President's seem to age enormously during their time in office from the pressures placed upon them. I know personally, I'd never want the spotlight and pressure that they have placed on them and their families. Thank you to all of our President's, from Washington to Obama for serving our country. A big part of Valentines Day is celebrating the people in your life who you care about and love. Cindy and I co-write a blog at http://moonlitbridges.com/ about our life and romance. It is our Valentine's Day gift to all of you, our readers. Another of my favorite photos from 2009 is one I took of my wife Cindy and I on our vacation at Fort Mountain State Park in Georgia last year. Here is the color version of the B&W from yesterday. It was shot in the early morning at Folkston, Georgia. 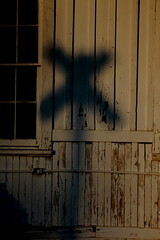 The Crossbucks cast a nice shadow against the warm colors of sunrise on the depot. 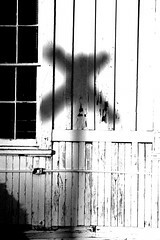 An early morning shadow against the Folkston, GA depot is one of my favorite photos from 2009. I loved the contrast between the shadow the wall with this photo. It also was good in color, but somehow I like the B&W more. You can click "Black and White" on the pages tabs at the top of the page to see some more of my favorites from 2009. 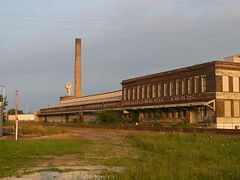 When I was in Sandusky, OH in 2006 I saw the abandoned American Crayon Company plant across the tracks from the Ex-NYC depot. Everywhere in the US we see abandoned plants. Industries which once flurished, now being made somewhere else (probably China) and a changed economic landscape left behind. How do we face the changing economy? We can either play the victim and say "Bring our jobs back" or you can say "How do I adapt to the new economy?" There are new opprotunities and new challenges, it is all how we look at it. The Journal of Commerce has a really good article about the state of the railroad industry. Top railroad executives are throwing down the gauntlet, serving notice to Congress and freight shippers they will push back hard against efforts to tighten rail regulations. James R. Young, chairman, president and CEO of the largest rail carrier, Union Pacific Railroad, said flatly his team opposes the version of a rail regulatory bill that cleared the Senate Commerce, Science and Transportation Committee just before Christmas. If you haven't read Emerson recently (maybe since High School or college?) this is a great collection to get cozy with him again. I used to do tweets as @Emersontoday but I found my time getting split too much between the accounts so I gave it and @Thoreautoday up. However, I still love his work and quotes. This weekend is going to be rainy here in South Carolina, hopefully I'll have a little time for some extra reading. 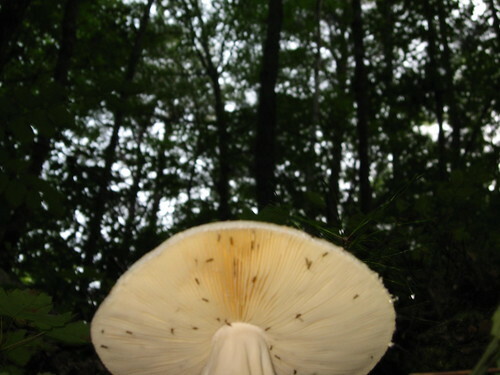 I took these mushroom shost during Cindy and my vacation to Fort Mountain State Park over in Georgia last summer. 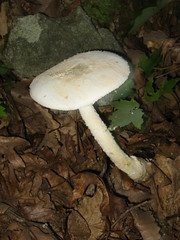 Nothing particuarly worth a photo, except that it was large and contrasted nicely with the forest floor at sunset. But when you look at it from a different angle.. it became a lot more interesting. Isn't life like this? Sometimes when we take a new approach, or look at something (or someone) differently it will improve our outlook on the situation. The waves roll in.. towards the beach.. on a cold Gulf Coast day. 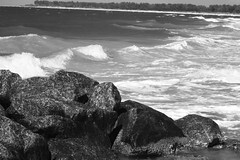 The wind was strong, when I visited Fort Desoto Park in Pinellas County, Florida in December 2009. Fort Desoto features a long gulf beach, as well as the historical fortifications from the Spanish American war in 1898. The park is a great place to beachcomb, birdwatch, surf fish, or just ride your bicycle along the miles of bike trails. The blowing sand and crisp weather kept the crowds away, and helped me to get some nice shots of "big waves" (at least for the Gulf) coming into the shore. There has been a light on Tybee Island to guide ships safely into the Savannah River since Colonial Times. The current light was constructed after the Civil War, the lower 60 feet of the tower being what remained of the 3rd light which was damaged by the Confederates to prevent its use by the Union Navy. The lighthouse is now maintained by the City of Tybee Island and The Tybee Island Historical Society. The US Coast Guard still maintains the light as an aid to navigation. Tybee is one of the most intact historic light stations, it includes the lighthouse, head keeper’s house, original summer kitchen, two assistant keeper houses, fuel storage building and garage. The head keeper’s quarters is now the visitor center, one cottage serves as a video theater. Visitors can climb the tower’s 178 steps. Fort Screven is another historical treasure on Tybee Island located next to the light station. The Fort was built during the Spanish American war in 1878 to protect the entrance to the Savannah River and remained an active US Army post until the end of World War II when it was sold to the town of Tybee. With the light station, nearby beach, and other attractions; lighthouse fans, history buffs, and romantics of all sorts will enjoy a visit to the Tybee Island Light Station near Savannah, Georgia. I purchased the 150th Anniversary edition of Walden which is illustrated by photographs by Scot Miller . Miller illustrates the classic with photos of Walden Pond and the surrounding countryside through all of the seasons and in its many moods. I really enjoyed the macroshots and also his detail work. A lot of people would of overlooked the things he saw in the details. The images really helped make this more than just another reading of the old classic. If you haven't read Thoreau's masterpiece in a while, or are looking for a great edition to put on your coffee-table or add to your Thoreau collection like I did.